Legowelt's brilliantly eccentric Strange Life records presents one of $tinkworx's best ever productions on the Coelacanth' EP, backed up with a sickly abstract Chicago mix from Syncom Data, and another deep space techno probe from $tinkworx on 'Amira'. 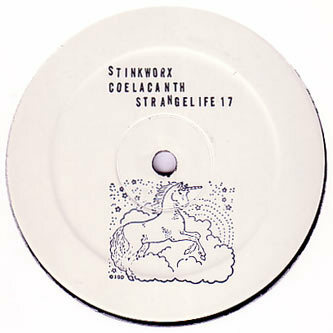 The orioginal version of 'Coelacanth' features the much underrated JT Stewart aka $tinkworx really getting to know his synths, teasing out some climactic techno-blues riffs over a moody electro funk bassline and reminding us of the killer current EP from Larry Heard. Hot schtuff. Syncom data's 'Data nerine' remix peels away the synths and lays them over a tough and slow boxbeat, coming off like a proper sleazy Chicago via Den Haag tripper, leaving $tinkworx's own 'Amira' to finish the B-side with a super deep Detroit synthline excursion with added BC style dub chords curling around beautifully ethereal atmospherics. fans of Convextion, SD records or Legowelt will fall in love with this.